Okay, this post should have gone up last week, but the site went weird and I couldn’t log in. Turns out, someone had gotten in and spammed/hacked me. Anyways, it’s fixed, so here’s the details of the giveaway! 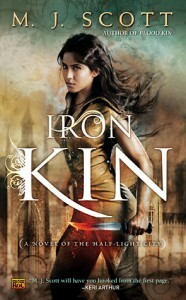 Buddy M J Scott has just received ARCs for Iron Kin, book 3 in her fabulous Half Light City series–and she’s kindly given me one to give away :) All you have to do is send an email to kez @ keriarthur DOT com (no spaces naturally), put Iron Kin in the header, and you’re in the running. I’ll draw it Tuesday evening, Aussie time (yes, you’ve only a day to enter thanks to the idiots who hacked me, so be quick!). That gives you a week to enter as many times as you like. Good Luck! The blurb : Imagine a city divided. Fae and human mages on one side, vampire Blood Lords and shape-shifting Beast Kind on the other. Between these supernatural forces stands a peace treaty that threatens to shatter at the slightest provocation….